If you ever catch me sitting at my computer there’s generally one thing right next to me_ a mug of tea. Whether its summer, winter, fall or spring, it’s truly my drink of choice. Warm, soothing and all out delightful. It’s as close as I’m going to get to enjoying a cup of English Breakfast with a scone in Oxford or Green Tea in the Orient, so I really try to take it all in. I love the taste, smell and even the process of making tea. I will admit, though, there are times when I need to get working quick and don’t have the time to wait for my tea to brew as every minute these days with three kids and work is truly precious. If I could sit down and magically have a cup of tea and yogurt berry parfait or a spinach cake muffin appear I would be a very happy girl. 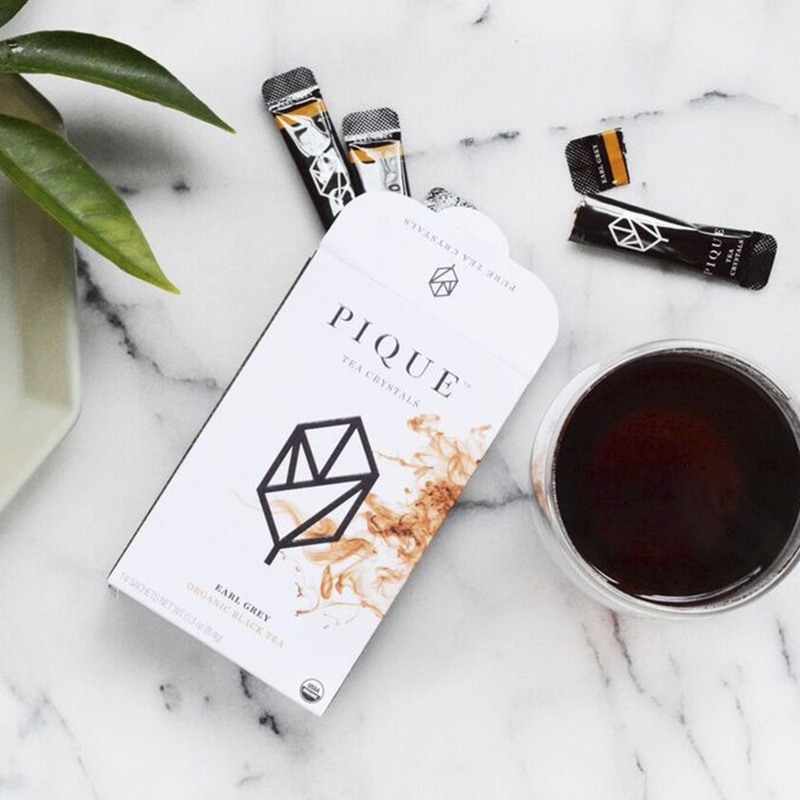 I recently started drinking Pique tea and became obsessed! Their slogan is "exceptional tea in an instant" and I totally see why. 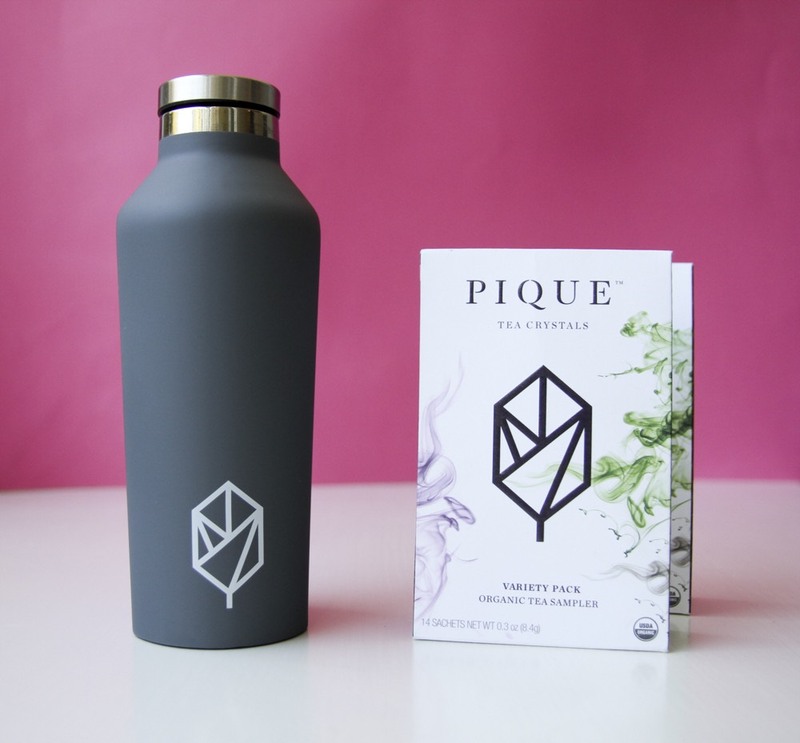 Pique takes whole-leaf tea, brews and then crystalizes it, so all you do it pour in hot water and you’re ready to drink. Instead of waiting minutes for your tea to brew, it’s ready in seconds. Tea is not only a delicious choice in beverage, it’s also good for you! Pique tea offers you 2 times the amount of antioxidants compared to leading tea bags and their green tea crystals have 5 times the amount. Ease and health? I was sucked in from the very first sip. While traveling this summer I also realized the sheer ease of carrying it with me. Whether I’m traveling or just on the move I can carry my to go cup and I’m ready for tea! I’ve been playing around adding the tea crystals to baked goods as well with really fun results. I’ve been buying tons of zucchini at the farmers market and decided to make zucchini muffins with it. 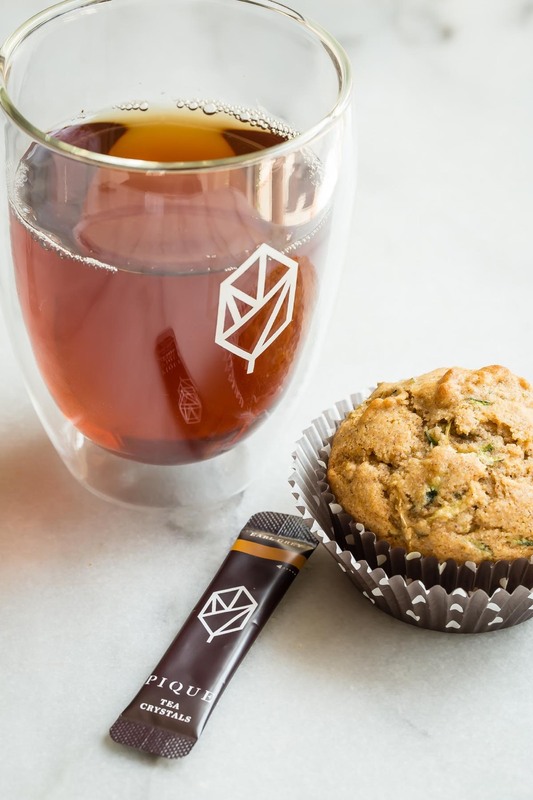 I was feeling adventurous, so I poured one envelope of mint sencha organic green tea into the muffin mixture and couldn’t get over how delicious they turned out. Just the hint of two delicious flavors alongside a beloved recipe that I dare play around with worked like a charm! Slather them with a little butter and drink it up with a cup of tea and you have double the pleasure. 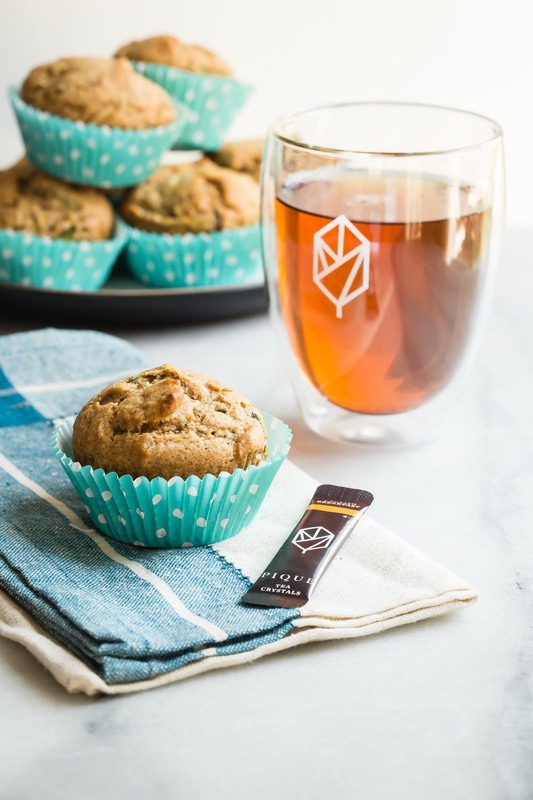 Follow this link for a chance to win a 1 year subscription of Pique Tea Crystals, and leave me a comment below telling me your favorite tea flavor. Good luck! 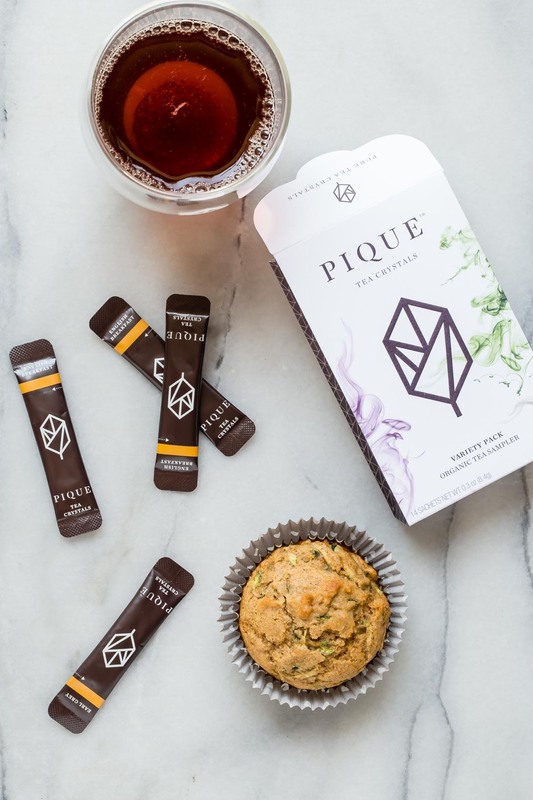 Pique Tea is also offering $3 off each purchase to Weelicious readers now through August 18th when you use the code WEELICIOUS at checkout! Also, check out their free trial promo! 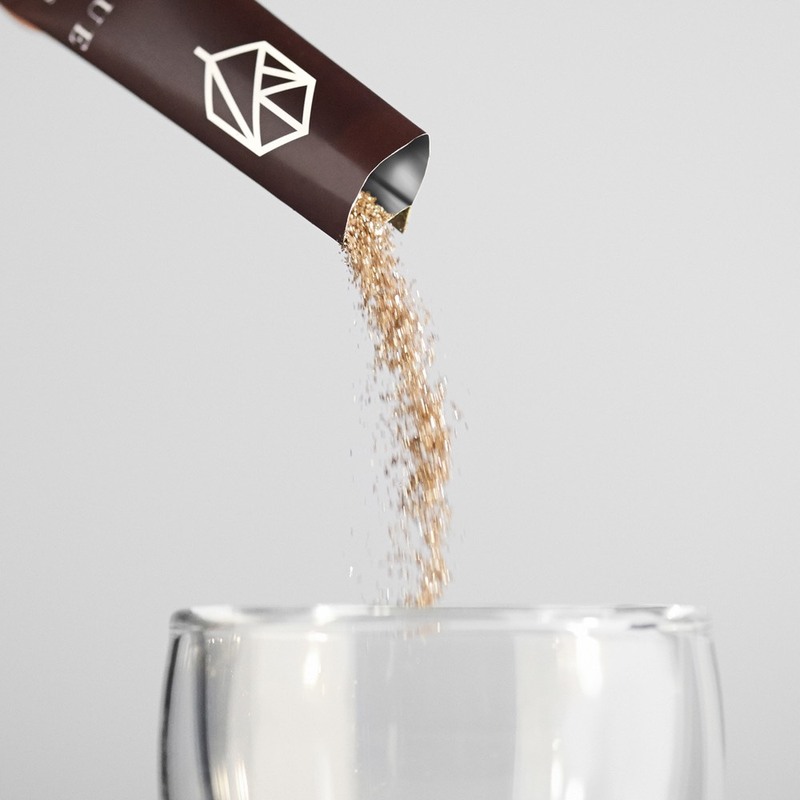 Prize_ One (1) lucky Weelicious reader will receive a 1 year subscription of Pique Tea Crystals (2 cartons/month) + ultimate hydration kit which includes Pique-branded Corkcicle bottle and double-walled Pique cup to have your tea crystals any way. This giveaway is sponsored by Pique Tea. All thoughts and opinions are my own. Duration_ This giveaway will be open until Thursday, August 25th at 11_59pm. How To Enter_ Follow this link_ https://bit.ly/pique-weelicious + leave a comment below. 2. Place the first 7 ingredients in a large bowl and whisk to combine. Three $100 Temp-tations Cookware Gift Cards Giveaway! I was just about to pour myself a steeping mug of Irish breakfast from Trader Joe's. It's my fave! I am obsessed with tea. I drink it all year round, too. So comforting and warm and delightful. Love tea everday, all year. Add a muffin and I am super happy! My favorites are Earl Grey (with lemon), Lady Grey or a fruity herbal. I love Earl Grey tea. It's my favorite, a cup of tea offers sanity in my day with three littles ages three and under! We love a good cuppa of English Breakfast Tea in the morning! I drink dandelion root tea almost daily with milk! I LOVE Pique tea! It has been a lifesaver for early mornings and a quick tea at work. I entered the giveaway and shared on Twitter. I love tea!! My favorites are green and peppermint! My favorite tea is English breakfast, but I love all tea! My fav is Sencha Green Tea! I love Chai and oolong flavors. I am bored with most of the teas I am familiar with, so it's great to try something new! I love tea, it's pretty much the only thing I drink all day! I think the Mint Sencha Organic Green Tea sounds amazing! Right now my favorite is Honey Pear. My favorite is english breakfast, but I love a chai latte as well! Earl Grey or English Breakfast! I love green tea and that bottle is lovely! We mostly drink green tea. My son likes lemon tea. I would love the mint green tea! I love a good cup of Irish tea, such as Punjana or Nambarrie. Would love to try Pique Tea. Would love to try this tea! I drink tea every day! This sounds great! I enjoy having a cup of tea. From green tea to peppermint and black teas! I love mint green tea. I ice it up and it's prefect for summer. I love chai tea and green tea. I am a chai girl! I love pretty much all tea but Rnglish Breakfast and a good cup of Chai are my favorites. I like that their tea comes in those packets. Easy to carry around. I love ginger peach tea! This is a fantastic idea for a product! I can't wait to try it. I drink tea every single day and my favorite is green tea. Fantastic! I love green tea. I love black tea; especially mixed berry. Cinnamon Sunset from Harney &amp; Sons. It's the best. I LOVE finding convenient ways to hydrate with the benefits of adding antioxidants! Tea is a great, easy way to pair your drink with your food, and its aroma can be either relaxing or stimulating.. it's completely up to you! LOVE this! Thank you for introducing this company to me! 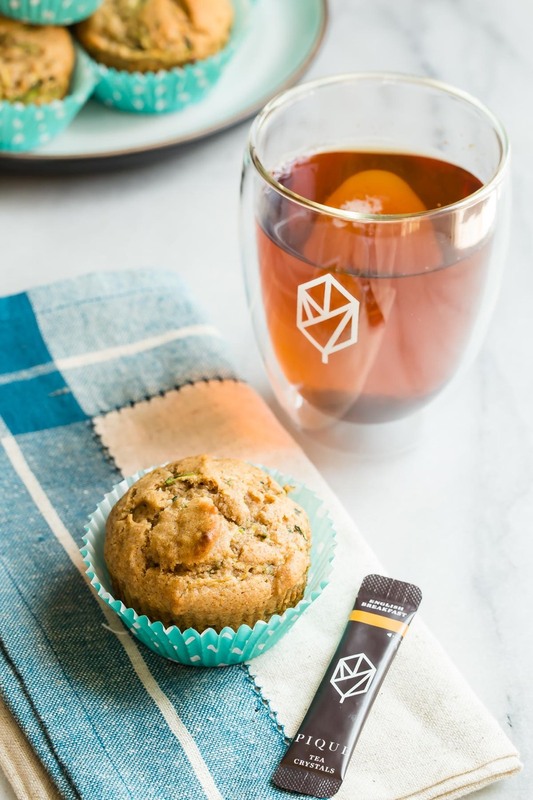 Would love to win so I can try out your tea products. I'm with you... tea only for me please! I love green tea during the day and a cup of chamomile before bed. I am very interested to try it! Chai is my favorite. These recipes look wonderful! I love tea! The green mint tea sounds awesome. Thanks for sharing. I want to do the trial now. This looks really interesting - would be great for camping! The Jasmine tea sounds so good. Would love to try all of them. I drink tea everyday!!! What a cool concept! Have to check it out now! Green Tea is my favorite. Oh! Never heard of Pique and tea crystals! Intriguing! My go-to hot tea is green tea. Love jasmine and oolong as well. And when I'm at a certain coffee shop, get the iced peach green tea or the iced mango black tea. And for tea with milk: chai latte or barley milk tea. love the milk teas hot or cold. 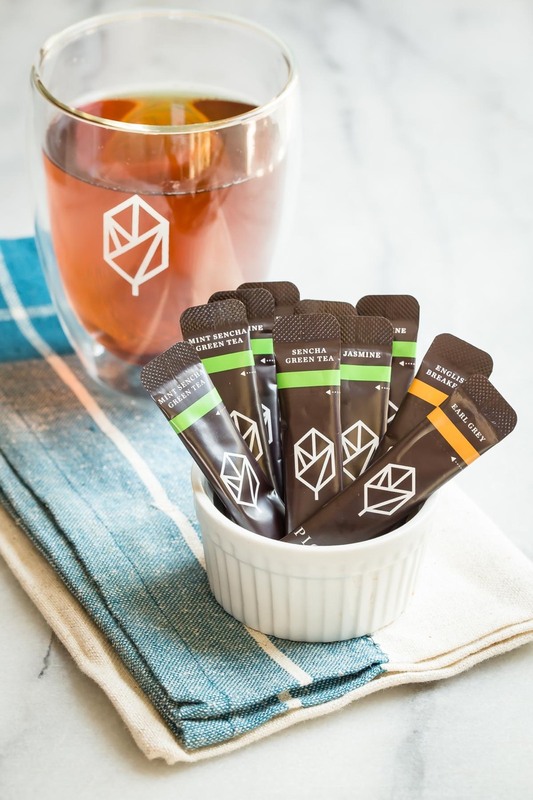 Love the concept of tea crystals! Sencha Green Tea would be neat to try out! Would love to try this tea! Love to try different kinds! I love peppermint tea! I do drink the stronger teas in the morning like English breakfast or an Indian Chai, then in the after noon a green tea, at night an herbal tea like peppermint or chamomile. LOVE English Breakfast in the morning and green tea in the afternoon. And at night? A good herbal tea hits the spot. Would love to try this! I have some powdered matcha tea I really like, but have never used tea crystals. I love any tea with vanilla hints. Especially vanilla lavender. Sounds like a perfect break for my day! Thanks for offering this giveaway! My favorite teas are Earl Grey and English Breakfast for day and Pukka Night Time for night. Great giveaway. Would love to try!